The Nokia Lumia 928, one of the smartest Lumia device from Nokia is being well promoted by the company and the Windows Phone guys, and the recent infographic does a good job by focusing on the Camera which is said to take some of the best captures at even the low-light conditions, which most of the other smartphone cameras fail to do. 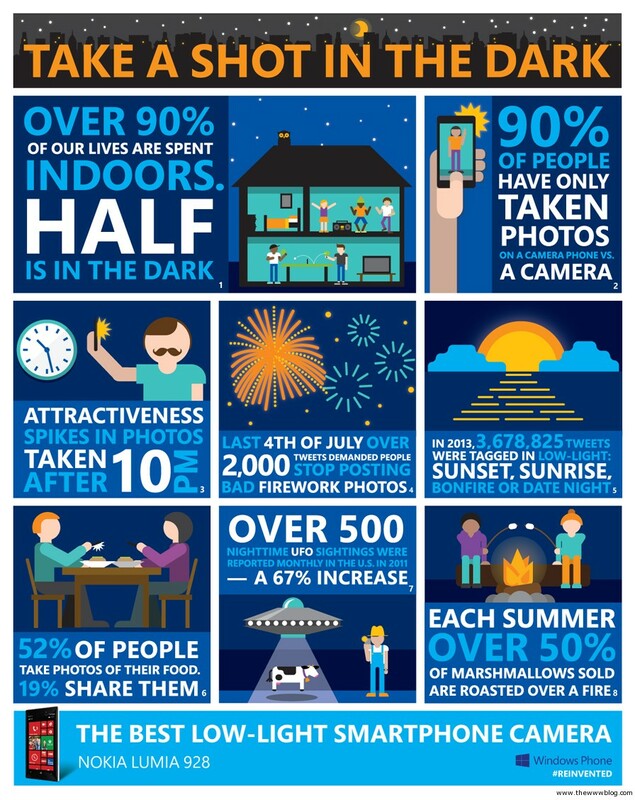 The first fact in that itself is a bit surprising, where it says over 90% of lives are spent indoors, and half of which is in the dark, which of course could be the night time at sleep. Another very interesting and easily justified point is that around 90% of people capture photos at night using a phone camera when compared to a camera. Not sure why Nokia is trying to sell its phones by promoting the camera, and by stating facts about the UFO appearances which has nothing to do with a phone camera, but when we actually talk about the Nokia Lumia cameras and the ability to have brighter photos at low light compared to other smartphone cameras, it does deserve the appreciation. Around 52% of the people take photos of the food, and this could be a very well known fact and the Lumia devices could come to a good use here because the restaurants usually have low light and that’s where the flash too makes the food look different in a capture. To talk about the Nokia Lumia 928, it’s a pretty decent Lumia device which comes with a 4.5-inch capacitive touchscreen and a 8-megapixel camera which comes with the Carl Zeiss Optics and the Xenon flash. The touchscreen is an AMOLED one with the corning gorilla glass and the Puremotion HD+.